Brown Rice Salad is easy to make. It is a delicious side salad or main dish. 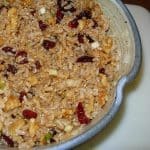 Mix rice, onion, walnuts and cranberries. Set aside. Whisk remaining ingredients until emulsified and then pour this dressing over the rice mixture. Stir and refrigerate for one hour or more.